* Transform gloomy days into happy celebrations! 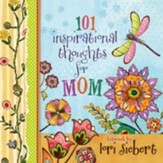 From a brilliant sunrise to a glass of fresh-squeezed orange juice, from a child's smile to the laugh of a loved one, inspiring quotes and Siebert's vibrant illustrations take you on a page-by-page journey to joy. Perfect for when you need a burst of inspiration! 64 pages, hardcover from Harvest. The vibrant art of Lori Siebert adorns a host of ways to notice and pass along blessings, big or small. This page by page journey through 101 simple joys—from a majestic sunrise to a glass of fresh orange juice to the laugh of a loved one—transforms bad days into good ones, and good days into celebrations. Readers can savor these sparklers of cheer one at a time, or when they need a burst of inspiration, they can enjoy these delights one after another. 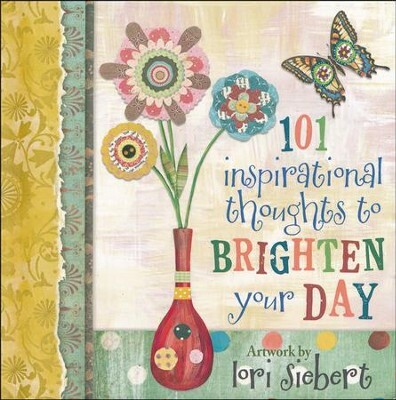 With an ever-expanding portfolio overflowing with originality, Lori Siebert started art lessons at age seven, then earned a degree in graphic design, and now has artwork featured in several books, including 101 Inspirational Thoughts to Brighten Your Day and God Cares for You. She divides her time between sewing, sculpting, drawing, painting, and designing new products. I'm the author/artist and I want to review 101 Inspirational Thoughts to Brighten Your Day.